Last Saturday my wife and myself decided to drive to Anglesey. Not sure where we will end up, but on the way we made our mind up and South Stack it was going to be. When we arrived in the car park after a 90 mile journey, what better than a nice cup of coffee and a piece of fresh double chocolate cake from the refurbished RSPB cafe'gift shop near the lighthouse. After a small walk along the cliff top, the magnificent lighthouse of South Stack comes into view, and what a sight it is. I know we were a bit early as far as the bird life is concerned but even so the noise on the cliff was still loud. 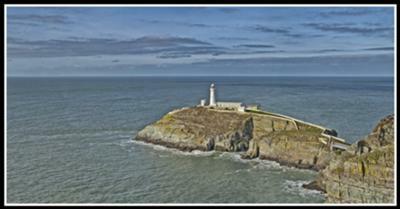 As I say, February is still a great month to visit South Stack and Anglesey coast to enjoy some lovely sea views. Anyway in weeks to come the whole place will be attracting hundreds, even thousands of people, coming to see the beauty of the wildlife on the coast and at sea. Well done Anglesey for having a gem of a place to visit. Ray McBride from New Brighton, Merseyside. Thanks Ray for your contribution. Glad you enjoyed the experience at South Stack (and the refreshments at RSPB cafe). For more about this attraction, which includes Elin's Tower, see the page about South Stack lighthouse. There is also information about the other Anglesey lighthouses here. For more local stories and articles, subscribe to our free Anglesey Today News here. It's as easy as 1-2-3!